I am not sure that UPP's business model is less predatory than "see this big parking lot that's empty all weekend? Park in it and see how much it takes to get your car back," the long-standing Portland parking protocol. 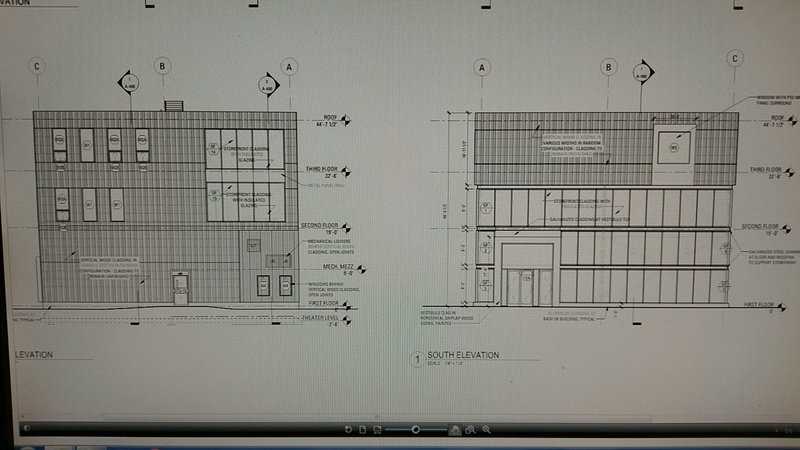 I went into the planning office to take a look at the initial plans for the Children's Museum move to Thompson's Point. I couldn't get the PDF's downloaded, but I snapped screenshots. First, the location plan. West is up in this one; it's going to go on the !-295 side of "Brick South" (the one that doesn't have all the bars). Next. the North and South elevations. Main entrance will be on the south side it seems. The Dalek on the top in this one is the camera oscura; I can't imagine the view will be nearly as interesting as the one from Free St. They mainly describe two external materials: "Storefront," which I assume is typical plate glass, and a quasi-rustic wood finish for the rest of it. Especially for a childrens' museum, it actually sounds pretty ugly. Just shy of 30,000 SF, not bad and larger than I was expecting. I wonder if this will revive plans to develop the adjacent parking lot (which I believe is under separate ownership but the vacancy of the CM may open up some possibilities). There were plans back in the 1980s (which I know about despite my age thanks to Portlander) to develop that site, and I continue to think it would be one of the most marketable residential projects in the state if it were developed. The upper floors would have unobstructed views to the harbor and sea beyond, and Starbucks, the PMA, and First Friday Art Walk would literally be at your front door ... not to mention all of the other amenities that come with living downtown in general (i.e., Old Port a bike ride away). If I won the lottery, you'd see a high-end building there in the next two years. a 5 story, 60,000 sf "build to suit" office building at Thompson's point. Good find Cosakita18. Hopefully we will be seeing more detailed plans for this on the city's planning board page. 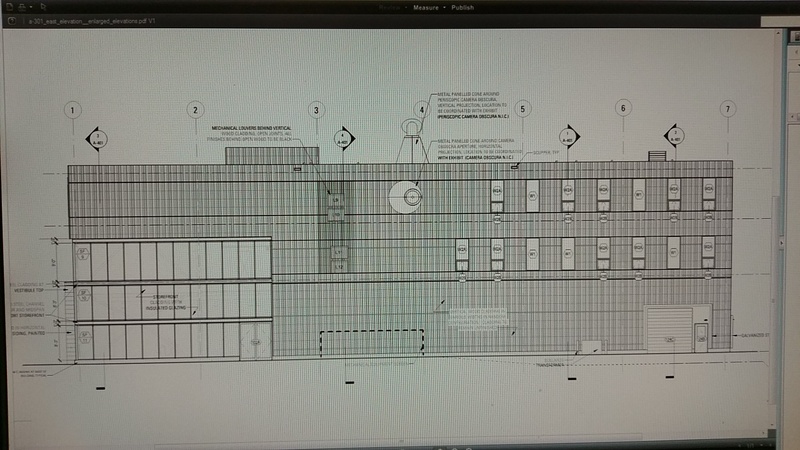 The only image available online shows a fairly unique industrial / art deco design for the hotel. Last edited by Cosakita18; 11-08-2017 at 02:42 PM. 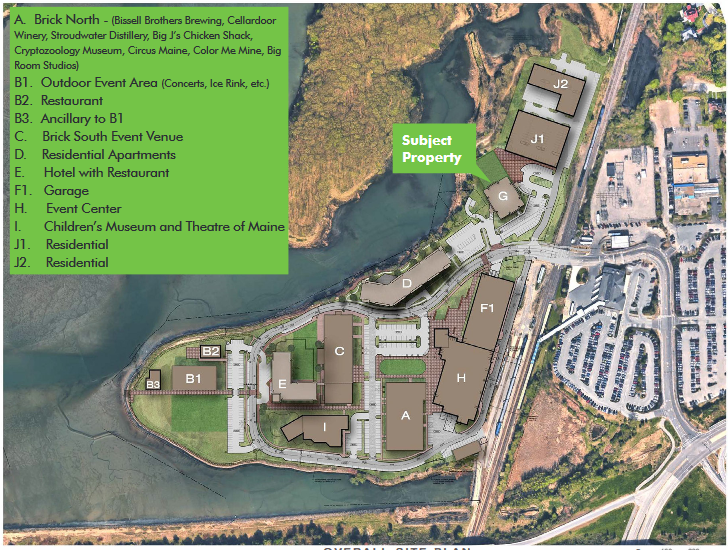 Developers plan to start construction next spring, to coincide with construction of a new building for the Children’s Museum & Theatre of Maine and a shared roadway and infrastructure. 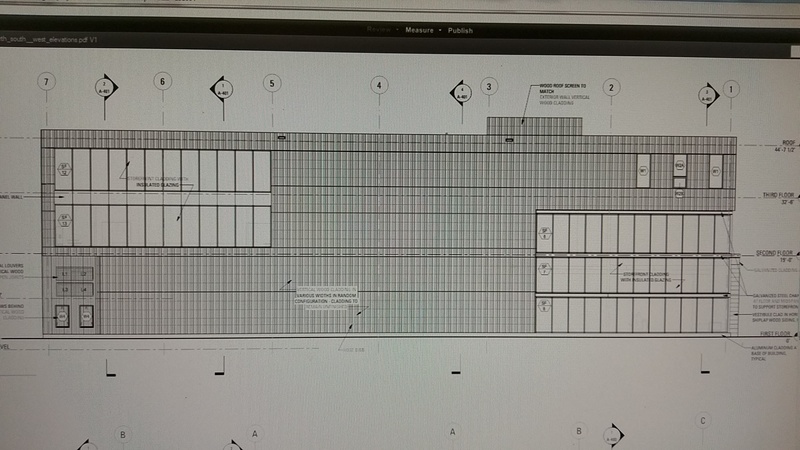 Most interesting to me, from the full packet on that Loopnet page, is the latest overall site plan for TP. Note that they've pushed the hotel down near the point; I believe it was originally going to be in the Building D area. The hotel is ending up where Building E is noted in that image, in between Brick South and the concert venue, as the article describes. Yes, as I meant when I said "further down the point". This earlier map, still on the Thompson's Point website, shows it in the position of Building D.
As far as I understand, the hotel was downsized based on the area's hotel demand (influx of other new hotels on the peninsula) and the residential component was made more prominent and moved up in the development timeline. Originally they were planning on about 60 housing units, but I think that's increased to around 100-120 now. It really is. Considering that it's looking more and more like Midtown will never get off the ground, Thompsons Point is probably the best site in the city for a large influx of market rate housing. I totally misread what you wrote. Sorry about that. Children's Museum design. Love it. 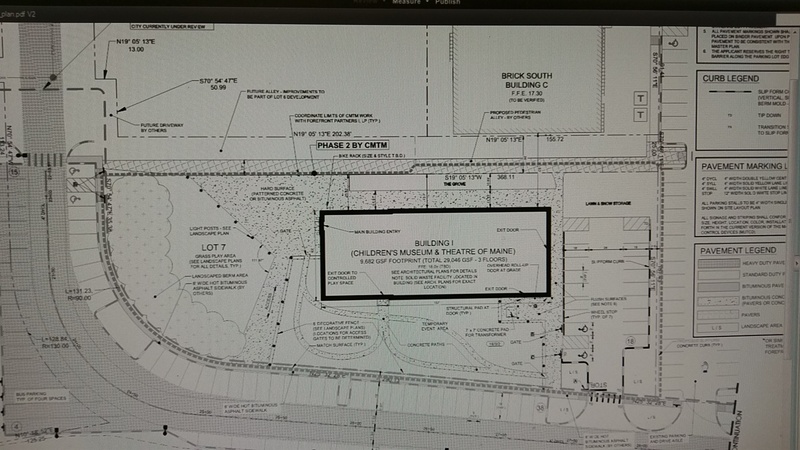 The hotel (exactly as shown in the site plan posted here on 11/11, just south of and attached to Brick South) goes before the Planning Board tonight. It's called the "Hotel Portland" right now with, so far as I can tell, no franchise name attached. The condo floors have been removed in favor of additional guest rooms. The comments from the neighborhood meeting indicate that they plan to start construction on Suburban Propane's new facility this winter, which aligns exactly with what the workers in SP's office told me last year. Work has started on the Suburban Propane facility on Riverside St.; they've done the utility work in the street and there is construction equipment on-site. Given that the site has gone to hourly paid parking everywhere, I wonder now what the plan is for the garage that was partially intended to serve the Transportation Center as well as the Point. I believe the garage is being built alongside the NNEPRA platform project at the PTC, with a walkway over the tracks connecting the garage to the transportation center, that's my understanding anyway and I have no idea when that project is scheduled. Personally I'm waiting to see when (if ever) they announce a residential component to the project. Now that they have a lively area, they need to get full time residents into the mix. The Children's Museum looks great, and would like to see an even greater entertainment vibe here. The access to Boston is easy and relatively short, so should become increasing popular. However, not sure if anyone in Maine realizes the scope of what's going on in Boston at North Station, or points connecting. Here's the latest: 40 story residential/hotel tower with dynamic outdoor plaza on 15th floor, with views of the city. A 35 story office tower, bowling alley, theaters, new restaurants, and a 1500 capacity "super club", a cutting edge night spot unlike any other in the U.S. Think Aura, much bigger, better, VIP options. Live Nation will be doing the bookings. TD Garden getting a major expansion with integrated bars nearer the top, with open views to the playing surface. This new complex will rival the Staples Center (LA) and, I predict some of the big glamour awards shows, which always seem to be in LA, Vegas, or NY, will consider and book for Boston now. The kicker will be, complimentary, European styled ferries (smaller, with glass tops) leaving a new dock from North Station to the new Encore Casino, which opens across the harbor next summer. It's a Vegas styled scale casino and will be, by far, the most dynamic outside Vegas. I think a lot more Mainers will be dropping their dollars in Boston next year (an understatement). When I think of Oxford Casino or Hollywood Slots, I cringe, as nobody, and I mean nobody, from outside Maine goes there (a net loss for Maine). Boston will become a highly competitive, year round, entertainment destination in the U.S., the world, with a "brain vibe" only a few subway stops away. Harvard and M.I.T. are one of the key reasons so much tech is locating to the city. Too bad USM can't get its act together. I don't like to be negative about things, but it's the cold, hard reality. USM should be a much bigger school with its basketball and hockey teams playing better teams in the Cross Insurance Arena (more entertainment options for Mainers). Except that, now this place needs a makeover too, as it has none of the social food and drink options that are the trend in all new arenas (lounges that look out to the playing surface). Last edited by TC_zoid; 11-17-2018 at 08:17 AM. You are wrong about Oxford Casino. I see tons of cars with out-of-state plates in the parking lot.